Plus, UBC and U of King’s College recognized in new award category for student journalism. 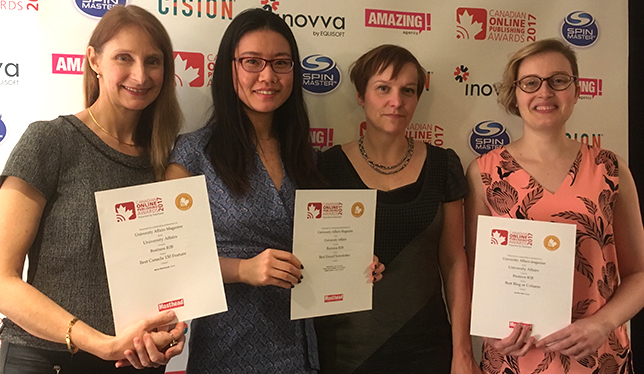 University Affairs took home three gold medals in the business-to-business media division at this year’s Canadian Online Publishing Awards, held in Toronto on Nov. 14. The magazine was nominated for eight awards in five categories – best trade media website, e-mail newsletter, blog or column, industry feature and Canada 150 feature. Feature writer Moira MacDonald won a gold award for her story, “Six Indigenous scholars share their views of Canada at 150,” which stood out as the best Canada 150-themed feature. Jennifer Polk won her third gold award in as many years for best blog or column, From PhD to Life (which has recently been renamed “Beyond the Professoriate” and expanded to include blogger Maren Wood). University Affairs also won a gold award for its e-newsletter and was a finalist for best trade media website. Moira MacDonald, Anqi Shen, Diane Peters and Jennifer Polk at the 2017 COPAs. Two other University Affairs blogs were finalists: The Black Hole (by David Kent and Jonathan Thon) and Speculative Diction (by Melonie Fullick). In the best industry feature category, writers Diane Peters (“Classrooms are getting a makeover to accommodate new forms of teaching”) and Rosanna Tamburri (“Why grooming the next line of university presidents matters more than ever”) scored nominations for their work. The COPAs were organized for the ninth year by Masthead, a website that serves the Canadian magazine publishing industry. University Affairs congratulates all winners, finalists, and the entire editorial team.